This is how OCTOPODA came to see the light of day; a range of ships with specifications similar to those of patrol boats or OPVs, but specifically adapted for mine clearance missions at sea using drones and robots systems. For these developments, ECA Group and MAURIC defined typical configurations for unmanned systems dedicated to mine warfare, based on the different components of ECA Group's UMIS system. This is a complete system of different drones that can collaborate within the same mission to carry out each step of a mine clearance mission: detection, identification and destruction. Each robot has a different role to play in the zone to be secured. They are deployed and controlled by a small team of operators on the OCTOPODA vessel, which remains in a secure zone. OCTOPODA operates outside the minefield, so that it does not have to comply with demanding specifications relating to acoustic and electromagnetic signature, and shock resistance. Inspired by MAURIC's patrol boat and OPV range, OCTOPODA vessels are based on sea-proven hulls, with ideal seaworthiness characteristics for launching and recovering USV surface drones, UAV aerial drones, underwater autonomous AUVs and remotely operated ROVs. The first results of this work are two vessels: the 30 m OCTOPODA 300, and the 50 m OCTOPODA 500. 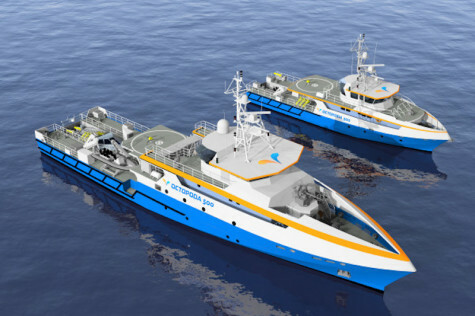 To design the first vessels in the OCTOPODA range, MAURIC's naval architects focused specifically on two fundamental aspects concerning integration of naval drones: the integration of launch and recovery systems that are effective even in high sea states, and the ergonomics of the drone deployment zones on board the vessel. So, the OCTOPODA vessels have been designed around these zones (aft deck, drone storage and maintenance hangar, drone system control centre). "The vocation of ECA Group is not to build ships. We are not a shipyard, we are in partnership with shipbuilders when a project arises. On the other hand, thanks to MAURIC and the new OCTOPODA range, we illustrate to our customers how our range of unmanned systems fits into different types and sizes of vessels. At each mission, a suitable UMIS system and a ship size to integrate it. “Over the months, this OCTOPODA range will be extended to other types of missions for UMISTM systems," says Guénaël Guillerme, CEO of ECA Group. The OCTOPODA 300 makes it possible to deploy a naval drone system from a vessel that is just 30 metres in length. The system consists of two A9-M AUVs, identification robots and destruction MIDS (Mine Identification and Destruction System) consisting of 2 SEASCANs and 6 K-STER Cs. These underwater robots can be deployed from OCTOPODA 300 or a 7m Rhib nested in an aft ramp. The OCTOPODA 300 also comprises a small landing platform making it possible to deploy a IT 180 UAV lightweight drone. The design incorporates a specific hangar with direct access to the aft deck and a control centre with a bird's eye view of the deployment zone, the objectives of which are to simplify handling of the robots and optimise operability of the entire UMIS system. For navies wishing to deploy a more sophisticated configuration of the UMISTM system, MAURIC has developed a 50 m vessel, the OCTOPODA 500, making it possible to launch and recover a 12 metre INSPECTOR 120 USV from an aft ramp. By adding this USV it is possible to deploy AUVs (two A9-Ms, two SEASCANs and ten K-STER Cs) in autonomous mode, and therefore penetrate further into the minefield. The UAV landing platform is larger and therefore makes it possible to land the IT 180 in more difficult sea states. With the development of the OCTOPODA range, MAURIC and ECA Group are proposing completely integrated solutions comprising motherships and UMIS systems dedicated to mine warfare. MAURIC thereby demonstrates its capacity to integrate any type of naval unmanned system (underwater, surface or air); today for mine warfare, but tomorrow for other missions such as surveillance, bathymetry, search and rescue, surveys for offshore industries or scientific missions. The OCTOPODA 300 and OCTOPODA 500 will be on show at the ECA Group stand at the EURONAVAL trade fair taking place in Paris Le Bourget from 23 to 26 October 2018.